Thank you for choosing to incorporate with Harvard Business Services, Inc.- your Delaware business specialist! If you have any questions, please feel free to contact us at 1-800-345-2677 and reference Order # 242!!!. Please print a copy of your receipt for record keeping purposes. *If you do not receive a confirmation email from HBS within the next 24 hours, please check to make sure our e-mail was not filtered as spam or is being blocked by your email provider. Please feel free to contact us with any questions. Would you like to comment on our services or provide your suggestions? Please, visit the HBS Blog for fresh new ideas and commentaries. Like our service? If you are one of our many satisfied customers, please give us a BBB review. 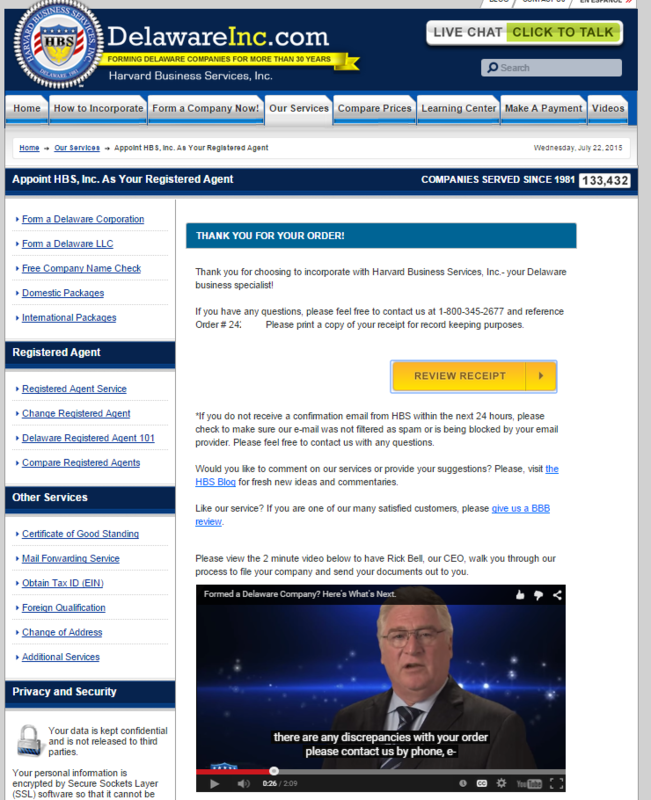 Please view the 2-minute video below to have Rick Bell, our CEO, walk you through our process to file your company and send your documents out to you. This page with a focus on Thank you for your order examples, was shared by Paperfree Team.